Aside from the NCSU Insect Collection, which is our largest and most prominant resource, the Museum houses other collections and equipment for use in systematic entomology. A large ultracold freezer houses specimens for long term DNA/RNA preservation. We expect this resource to grow, both in terms of numbers of specimens housed and in space allocated for cold storage. 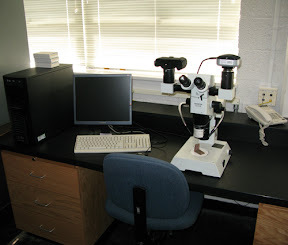 We have three main systems for imaging and videoing specimens, including a digital camera, a GT Vision EntoVision system, and a stereo microscope equipped with film and digital video cameras. Many of the taxa we use in our research require special preparations for preservation, scanning electron microscopy, and dissection. We have a critical point dryer available for these purposes. Over the years we've acquired a collection of bulk material from numerous localities in NC and the world. These materials are valuable as faunistic time capsules, and we hope to push through these jars and process the specimens soon.